New Age Serum Reviews - Is it a Scam or Legit? New Age Serum is an online-only, trial-based anti-aging cream that claims to help reduce the appearance of dark circles and wrinkles, repair skin, and more. The Instant Wrinkle Reduction technology in New Age Serum (branded as Neo Hydrate Gold) claims to be proven to boost skin moisturization, increase firmness within one week, and visibly decrease the appearance of fine lines after four weeks—so much so, that they advertise you’ll take more than 10 years off your skin. Whether in the morning or evening, simply apply the serum to clean skin, allow plenty of time for it to absorb, and then follow with your preferred moisturizer. Within minutes, the formula will start working at the cellular level to promote collagen and elastin production, resulting in plumper, rejuvenated skin. It’s well understood that collagen and elastin are important components of healthy skin. Can you realistically expect New Age Serum’s ingredients to boost these proteins and deliver the results advertised on their website? We’ll start with the basics. There’s no need for a science lesson here, but it’s important to ensure that everyone’s on the same page before diving in. Proteins are long chains of amino acids that play very important roles in the body, but act primarily as structural components for muscle, hair, and skin. In the latter, the two most common proteins present are collagen, which acts like an underlying framework to support skin, and elastin, which delivers elasticity and allows skin to spring back into shape after being stretched. While both of these proteins are present in high levels when we’re young, some estimates indicate that we begin losing about one percent per year upon reaching the age of 40. Combined with other factors like UV damage, environmental exposure, and lifestyle choices, this cumulatively results in skin that wrinkles, sags, and otherwise loses its luster. According to Dr. Justin West, Medical Director of Finesse Plastic Surgery, though, replacing these lost proteins by means other than injection (whether external creams like New Age Serum, or internal dietary supplements) isn’t shown to work in a clinical setting. “A big myth is that we can replace lost collagen in our skin by eating more collagen, or applying it to our skin with topical products,” he says. This is because the amino acids in collagen or elastin (or other ingredients) don’t magically reassemble into proteins when consumed orally. With these core details in mind, which ingredients does New Age Serum use in its formula? According to websites like Paula’s Choice, Truth In Aging, WebMD, and EWG.org, most of these ingredients work as skin conditioners (glycerin, Aloe barbadensis juice, caprylyl glycol, heyxylene glycol), coating agents and film formers (hydroxypropyl methylcellulose), drying agents (ethanol), and preservatives (phenoxyethanol, potassium sorbate). There are a few exceptions, however. Hyaluronic acid is a molecule that has the ability to hold several times its weight in water, as well as to improve cellular turnover, which thereby helps the skin maintain moisture and a healthy glow. Like its silver counterpart, colloidal gold simply contains particles of gold suspended in some type of solution. While we learned from these sites that it’s often used in medicine for drug delivery and gene therapy, none indicated sufficient clinical evidence that it can help improve the condition of skin. However, they report there’s little-to-no research indicating it can address other potential facial concerns, such as wrinkles, fine lines, dark spots, or under eye bags. Finally, the Methyl Glucoside Proline Lysine Copper Complex found in New Age Serum is also contained in several other anti-aging cream formulas, although these same sites didn’t indicate sufficient clinical evidence that it’s beneficial for skin. Could New Age Serum’s Ingredients Cause Side Effects? Other than potential mild, temporary redness or irritation at the application site for especially sensitive individuals, Paula’s Choice, Truth In Aging, WebMD, and EWG.org indicated that most individuals won’t experience side effects from New Age Serum’s ingredients. It’s also important to keep in mind that exfoliating ingredients like hyaluronic acid can increase sensitivity to UV rays so be sure to wear plenty of sunscreen. As usual, it’s a good idea to speak with your dermatologist before beginning any new skincare product, who can help identify potential side effects based on your specific diagnosis. How Much Does New Age Serum Cost? 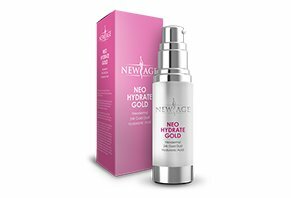 If purchased from the main New Age website, one bottle (30 ml) of their Neo Hydrate Gold serum is priced at $49.95. On the other hand, if you place an order through their BuyNewAge.com landing page, your only option is to pay $6.97 for 14-day trial. After the trial expires, you’ll be charged $69.95 for the full-size bottle you already received. Then, you’ll continue receiving monthly shipments and charged $69.95 each time. All New Age Serum orders come with a 30-day refund policy, less S&H charges, although their terms indicate it “must be unopened and unused with safety seal intact” to qualify. Customer support can be reached at 800-640-3456 or customerservice@newageskin.care. What Can We Learn From New Age Serum Customer Reviews? Since writing our original article, more than 30 readers had provided feedback about their experiences with New Age Serum, giving it an average rating of about 1.5 stars. While more than one customer seemed pleased, common complaints revolved around no results and problems with the 14-day trial. According to the BBB, as a company, New Age Skin Care is based out of Tempe, AZ and has been in business since July 2013 with a rating of a B as of 5/14/18. Although, it appears that they are currently not accreddited with the BBB. As you likely already recognize, from capsules and creams to serums and proprietary ingredients, there are potentially thousands of anti-aging products like New Age Serum competing for your hard-earned money. In fact, copying and pasting Neo Hydrate’s ingredients into Google returned another product (Primesse, $49) that appeared to feature an identical formulation. Given this mind-boggling number of choices, what’s the best first step for figuring out the right option for you? Talk with your dermatologist. During your appointment, they can discuss your needs and concerns, evaluate your skin, and order tests, if necessary. From there, they can recommend science-backed treatments that might deliver the most bang for your buck. Does all of this bode well for New Age and their Neo Hydrate serum? To this extent, while the Clinical Study page of the New Age website indicates that their Neo Hydrate Gold Serum provided a wide variety of benefits for participants, it doesn’t appear to have been published in a peer-reviewed scientific journal and wasn’t available for third-party review at the time of our research. Furthermore, it seemed that the company had less-than-stellar overall reputation among HighYa readers, most of whom cited similar complaints. If you decide to give the serum a try, though, it appears that you’ll pay a lower price through their main website, versus their standalone Neo Hydrate Gold landing page. And finally, while New Age seems to stand behind their products with a 30-day refund policy, less S&H, keep in mind that as soon as you try it, you own it. Editor's Notes: This article was originally written on October 22, 2015, but was revised and updated on May 14, 2018 at the company's request. I warn you to not purchase from this company! I ordered to try the cream, they auto-charge your card without your knowledge or permission. I called them when a box showed up and said I didn’t want this and they had charged my card. I mailed back their box and waited almost a month for a refund, then they charged me $11 for shipping, and I paid for the return shipping. This was after I was the one who had to call and say I mailed the box back a couple of weeks ago. Their product is not worth the money AT ALL! When I called to ask to be refunded the total amount, the representative was rude and basically said I am out of luck and maybe I should have read the fine print. All they had to do was do right by me as a customer to make me feel like I was not being ripped off. When I got the product, it was already 5 days into the 14-day trial period, when I called it was less than 14 days that I had the product, but they told me I called 2 days late! This was never posted on the online ad, so if you do get this product make sure if you don’t want to be charged $79.31 to call within a week of receiving it. Or else you will be taken for $10+. This company is a SCAM AND A RIP OFF! I will make sure anyone I care about or know is aware of how this company cheats customers out of money! I bought some of this and it doesn't do anything. In fact, it made the bags under my eyes look worse. I followed the instructions to the letter for 60 days. I actually noticed that my bags looked worse using this product along with the moisturizer. I was very disappointed. Why would it make the bags under my eyes look worse? It certainly wasn't worth the money for this product. Nowhere when purchasing the trail serum does it say you're signing up for a subscription. I bought this in November 2018 and thought okay, for the price on the trial wouldn’t be so bad. I accidentally clicked twice the submit button and it said it’s a duplicate order. I thought well, it wouldn’t hurt to keep the second one, especially that it was during the holidays. So much is going on and who wants to be on the phone with an online company. Lo and behold, I got another bottle in January! Like, wait a second, now this has to stop! They charge your card $29.95 for each bottle and I’m still on the first one! So now I have all these bottles! I called to cancel and the guy was so rude and was basically blaming me! It’s a scam and nowhere in the paperwork when you get the item does it say "Thank you for your subscription!" So you're blindsided! The fact that they aren’t honest shows how it’s about them getting your money and not about the honest results of the product! The company refused to take back the other two because it was over 30 days! It’s a scam and not worth the trial because the product is garbage. I ordered the free sample as I have a hard time finding a face regimen that I’m not allergic to. NOWHERE on the free trial page did it tell me that I was signing up for recurring shipments. My bank even flagged the attempt to draft payment as a fraud claim, and New Age had tried repeatedly to draft money. The bank representative said this is happening more and more. I will NEVER order a FREE sample without making sure I’m not signing up for something I didn’t ask for first. Such a horrible way to do business...sneaky and unethical. I agree! The same happened to me and it was during the holidays. I accidentally clicked submit twice and it said duplicate order. I thought well, let’s see if I get a second one. I got the first order then a with how fast time goes by didn’t realize it was about a month till I got the second one, which I thought was a duplicate. I figured if I keep it, it wouldn’t hurt to avoid having to deal with customer service for a product in December. Then I got a third one, and I thought okay now, this needs to stop. I haven’t even finished the first one! I called customer service and he said it’s a subscription! I said sorry, I would have not bought it if it was a subscription! He refused to take back the items and was rude! And honestly, the eye serum doesn’t do what it claims. I found a better eye cream that it worth the price because it actually works! Do not buy, they are just robbing people with the subscription. For the money it costs each serum you will be getting what you pay for and it’s garbage. I want to first address the effects on my skin. Since using this I have been mistaken for 10 to 20 years younger than I am, which is 56. I will never be without this. Now to address the 14-day trial, I needed to adjust when it was mailed to me, and customer service was very cooperative. I rescheduled my next shipment for two months out, and I eventually told them I only needed it every three months...used sparingly this goes a long way. They complied with my wishes. I strongly recommend this! I have breast cancer and feel like I have aged 10 years from the whole experience. I tried other creams for fine lines and wrinkles and nothing seems to work. So far after 7 days, I noticed pores looking smaller. I am very happy with any improvement I can see in this amount of time, so very hopeful for future improvement from using products. I want to mention customer service is so nice and helpful. New Age Serum is so silky, and when I apply it to my just washed face, my skin just drinks it right up. I can see the difference around my eyes and lips. My family, mostly my sisters, noticed and told me that my skin was glowing. I love this product, and I've recommended it to everybody I talk to. During the trial time, I have noticed the products being refreshing and adds a nice glow. I can see a small start to diminishing lines. The serum and cream work well together and feel nice on my face. The customer service people were very helpful and quickly answered my concerns. I will be continuing with these products and look forward to great results. Ok, I am 62, so have enough lines that need taking care of. I do not know about the longevity of results. But I can tell that the serum does smooth out my skin. Maybe some of the people who complain do not have enough lines or do not let it dry thoroughly before moving on to the next step, but if you have lines and don't think this will work for you, all I can say is, try it. I use retinol on my face first, not this company's as it is not one of the products I received. I let that dry completely then put the Neo Hydrate Hold serum on. Also, let that dry completely and now see lines smoothed out. The deeper ones can still be seen, but are minimized. I then put on the face cream with shea butter and Matrixyl 3000. Allow that to absorb and continue with the regular routine. Most days that is nothing. But if going out, I apply makeup. This does work for me. I can't speak for others, but I will keep buying as long as I get these results. Love! Love! Love these products! I received all three products - Vitamin C And Hyaluronic Kit Eye Serum, the Neo Hydrate Gold Face and Neck Serum, and Advanced Anti-Wrinkle Cream Anti Aging Retinol Moisturizer. I have been using these since early November and I have to say I am super happy with the results. I am 67 years old and the difference is so noticeable. My daughter told me the other day that my skin is so smooth and glowy and that I do not need any foundation or concealer. We had a picture taken on my birthday, December 3rd, and put it out on her Facebook page. I got so many compliments, it was unbelievable. What I do firstly, is apply the Vitamin C Eye Serum, not only under and around my eyes, but my whole face and neck. It spreads easily so I do not use much. I leave it for about 2 to 3 minutes and then apply the Neo Hydrate all over, paying special attention to my forehead and where wrinkles are found. After this dries completely, I put on the Retinol Moisturizing Cream on my face and neck. I do this in the mornings and also in the evenings. It has made a great difference, I tell you. In the future, I will buy all three products from Amazon as I can get all three including free shipping for less than $40.00. So far, I still have enough to last me a month, so it does come out very economical at about $20.00 or less a month and using all three products generously. Do remember, please, if you could, use the Vitamin C Eye Serum all over your face because it sure makes a difference. The New Age Serum or cream doesn't work on wrinkles at all. I have been using as directed and not pleased at all with results. Well, I will not be purchasing products in the future. I feel this was a waste of my time and money. The videos demonstrated for buyers are fake. It shows the wrinkles fading away, but when using the product, it's not the same. I agree, and honestly, it’s obvious that the reviews that are giving 5 stars and "love love it" are fake! Made by the company with fake names and sob stories about being a customer with cancer to make it more believable! You will be charged for a monthly subscription of $29.95 and customer service was rude! Write a Review for New Age Serum!